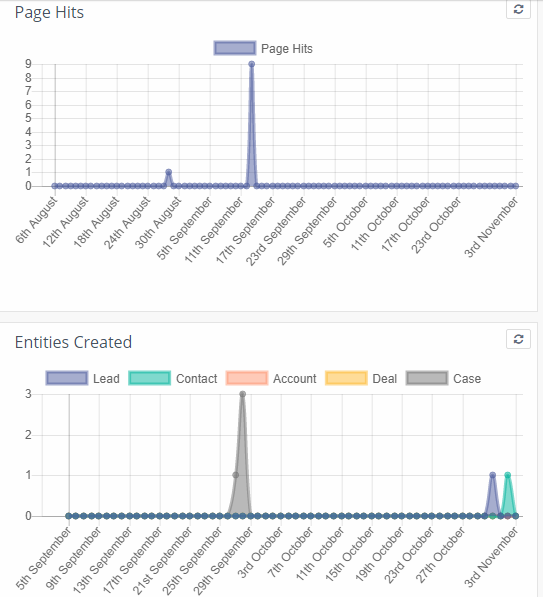 In CRM, dashboards provide a clear and accurate picture of your business. They offer an overview of your company’s key aspects such as sales, marketing, etc. You no longer have to lose time by searching for relevant and up-to-date information in different places. Dashboards will give you a single, one-at-a glance overview of your business. They give an end to obsolete ways of viewing important data. Any time you refresh the dashboard, you will get fresh and relevant data about the performance of your marketing campaigns, sales and other vital metrics. You will know what is happening in your company, right now. There’s nothing more important than getting relevant and up-to-date information about your business. Use multiple dashboards to manage your sales team and work processes throughout your business. Our interactive and up-to-date dashboards help you get a huge insight into how your sales team is doing, for example who has closed the most deals, who has converted the most leads and other vital metrics. In Flexie CRM, you can use existing dashboards, customize them to fit your business’s needs, or even create new ones. Because your business may have specific needs, you may want to create your own reports and view them in the dashboard. For example, you may want to see who has visited your page over the past month. Or you want to see how many leads, contacts, deals or accounts have been created during the past week. By adding dashboards (widgets), you can see updated results in the dashboard. The user-friendly interface helps you find what you need. Simple, intuitive and very interactive.